Is gambling becoming an issue for you? 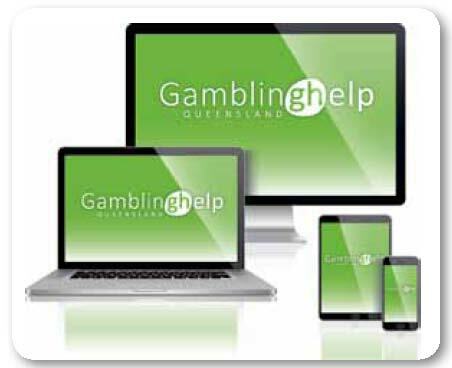 If you, or someone you know, is experiencing problems with gambling, visit the Gambling Help Queensland website at gamblinghelpqld.org.au on desktop, tablet, or mobile. Responsible gambling tips: Take a look at tips to avoid risky gambling. Real life stories: Listen to real people talk about how gambling became a problem for them. Friends and family: Check out helpful tips for starting a conversation with someone who may have a gambling problem, and explore frequently asked questions often asked by family and friends. •Help and support: Explore help and support options including contact information for free and confidential counselling, self-help, or self-exclusion (banning) from a range of gambling products and services. 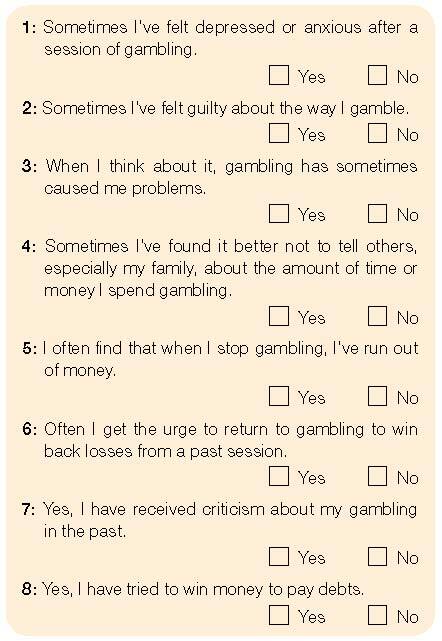 If you answered ‘Yes’ to four or more questions, gambling may be causing you problems. To get help, or to talk about whether gambling is becoming a problem, call the Gambling Helpline, 24 hours, 7 days a week on 1800 858 858 or visit gamblinghelpqld.org.au. 1 Source: ‘Eight’ Gambling Screen—Early Intervention Gambling Health Test, developed by Sean Sullivan, Goodfellow Unit, Auckland Medical School.